Fonomo can extend the popular Pidgin instant messenge to support video, makes it easy to send video chat invitations through Pidgin conversationwindows. Your friends do not need to install any software. Simply click the webcam icon in your Pidgin conversation window, and they will receive an invitation link. First install Pidgin,ubuntu 9.04 have it installed by default. You can download the Fonomo plugin from here,or go to this page. 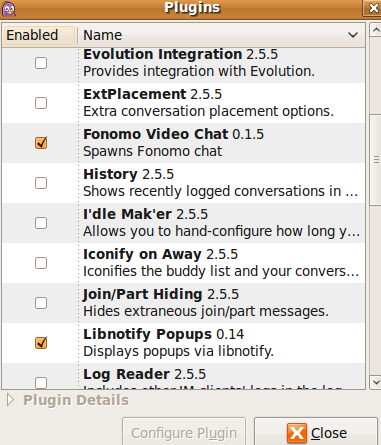 Now,restart Pidgin and Click to Tools->Plugins,enable it by check the Fonomo Video Chat 0.1.5 checkbox. 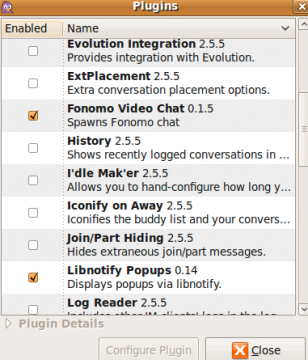 9 users responded in " How to install Fonomo plugin for Pidgin "
Navigate to the folder where you downloaded the package.Right click on it and Select Extract Here. thanks, how do i locate the file folder int he terminal window? You can type the start of the name, such as pidgin-fono and press tab to complete the command.or press twice to see the available commands beginning with pidgin-fono. Keeps telling me: Package pidgin was not found in the pkg-config search path. I have just followed all your steps and when I restart Pidgin I can see the cam icon. I wonder if it is normal that when I click on this icon it opens a link to the Fonomo web page. This is very slow from my country. Is there another posibility? I thought it would automatically open a window with the video like in Yahoo Messenger but it isn’t like that.